50 years ago, Grandpa got his start as a handyman. Not long after, he started a small business building high-pressure laminate cabinets. 20 years ago, Dad took the helm and built the business to more than $100 million in sales per year. 5 years ago, we lost Dad to an unexpected heart attack. 3 years ago, my brother and I fell out when we couldn't agree on the future of the company. He left; 2 key leaders followed him. Last year, I shut the doors on our factory for the last time. We've heard stories like this one too many times to count. One generation built, and the next one destroyed. It wasn't because the latter was lazy or incompetent, but because essential conversations about family business succession sat on the back burner until it was too late. When the unexpected happened, the business was left reeling. Key positions were undetermined, authority was never handed down, and the succeeding generation was left struggling to pick up the pieces. In failing to plan, the family business planned to fail. Surveys show that nearly half of the family businesses in the U.S. have a written succession plan in place. In Canada, that proportion appears to be similar. On closer inspection, however, a mere 17% of Canadian family business owners have taken the time to capture that plan in writing. In practical terms, that puts Canada in a much more precarious position than her neighbor to the south. In Latin America, matters are even worse: a mere 9.9% of family businesses have a plan for successfully transitioning into the next generation. China is only marginally better at a flat 10%. 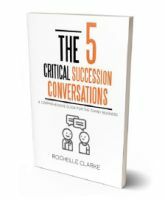 According to this brief overview of the available research, failure to plan for succession represents a global crisis amongst family business owners. We can't attribute to this phenomenon merely to cultural context. Instead, it is a universal product of the intense interpersonal dynamics that emerge in any workplace-especially one made up of family members working in close proximity. 1. Lack of Time - As Michael Gerber has observed in his book The E-Myth Revisited, most business owners spend too much time working in their business to work on their business. The pressing matters of the day inevitably swamp long-term discussions about succession. 2. Overwhelming Complexity - Succession planning takes time, diligence, and close attention to detail. The intricacy of the process can quickly overwhelm even the most detail-oriented business owner. Not sure where to start, many put it off until they no longer have a choice. 3. Lack of Communication - 70% of family businesses will fail in their second generation. Of those, 60% attribute their failure to communication woes. Especially in family-owned businesses, unhealthy patterns of communication will present severe challenges to developing a comprehensive plan. 4. Interpersonal Conflict - Family dynamics don't just cut off communication. They also give rise to conflicting loyalties amongst employees. To plan well, owners need to negotiate a middle ground with care. Often, the impasse created by these tense dynamics shuts down planning altogether. 5. The Ostrich Syndrome - To plan for succession, an owner has to admit that he or she won't be around forever. For some, this triggers an existential struggle. Rather than face up to the fact that life will go on without them, they bury their head in the sand and carry on without a second thought about the future. The stakes for family business owners are abundantly clear: fail to plan, and you will plan to fail. That much is beyond dispute. To succeed into the second generation and beyond, owners must provide a comprehensive plan. They don't just owe it to their successors, but to themselves and their employees as well. When it comes time to pass the torch, nothing could be more important than a clear set of instructions to help light the way.